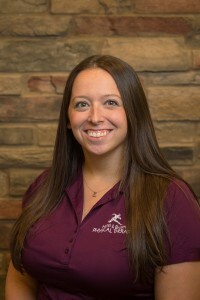 Jackie earned her Doctorate of Physical Therapy from Gannon University in 2012 after completing her Bachelor of Science in Biology, also from Gannon in 2009. She worked as a physical therapy tech at Hertel & Brown for four years before joining the team as a licensed therapist in 2012. Jackie is also certified to do functional capacity evaluation (FCE), which is the physical assessment of an injured worker or accident victim designed to measure his or her ability to perform work-related tasks. These evaluations can help in developing a treatment program, determining if an injured worker can return to work and when they can return to work. Jackie has completed additional training in treating vestibular disorders. Vestibular rehabilitation is an exercise-based program designed to help individuals with acute and chronic symptoms of vertigo, dizziness and/or disequilibrium resulting from damage to the vestibular system. Jackie’s additional training in the assessment & management of vestibular disorders allows her to help patients reduce symptoms of dizziness as well as improve balance impairments. Jackie enjoys sailboat racing, kayaking, skiing and shopping.